AUD/USD rangebound in the Asian session. 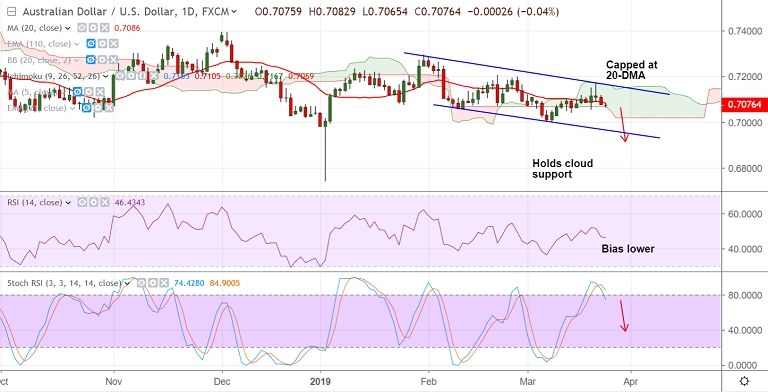 Aussie muted amid risk aversion. Growing fears of slowdown in the U.S. as indicated by the inversion on the yield curve keep investors away from risk assets. The pair has made an intraday high of 0.7082 and a low of 0.7065. We have no clear indication of intraday direction from the technical indicators. Major trend is definitely bearish. Price action extends downside in slopping channel. Immediate support is seen at daily cloud base at 0.7069. Break below will see further weakness. Stochastics RSI indicator is at overbought levels and on verge of rollover. Break below cloud will see downside till channel base. Break above 20-DMA at 0.7086 finds next major resistance at 0.7165 (converged cloud and channel top).